“That which is written on stone” is only one of the meanings given to this city’s name which is the birthplace of many celebrated teachers and artists. It is located near the Yucatecan coast (Santa Clara belongs to this municipality and is only 15 minutes away), and is known for its colonial buildings and the secrets they keep. In Maya “tun” means stone, “dzib” is writing (a similar word, “dziz” means to defeat) and “dzom” means soaked (although similarly “dzon” is blowgun); many writers and specialists have interpreted this name only to come up with different versions. But the truth is that Dzidzantún can be experienced in many ways: by touring its cultural and colonial buildings which coexist beautifully with its current residents and a new street of murals; or by enjoying the natural beauty of the nearby seaside. Just like its name, there are many meanings you can give this city, and many ways to explore it. Human and hybrid figures carved in stone welcome you from the façade of the former Convento de Santa Clara de Asís, which dates back to the 16th century. I explored the halls of both stories and discovered the paintings on its walls and ceilings. Depictions of popular religious scenes, animals (peacocks and felines), angels, crowns, and phrases in Latin have witnessed the rich history of this place. You will love visiting the former convent, particularly if you’re an avid photographer. Ask the church custodian if you can visit the original altar which is behind the altarpiece, you’ll truly feel like you travelled back in time when you see its ceilings and paintings. The Franciscan-style former convent has an atrium, a vegetable patch, and tons of places to photograph. If you ask for permission, they may even allow you to go up to the roof to get a better view of the city. Close to the Plaza Principal is the municipal market which comes to life in the mornings and evenings. You can also visit the Palacio Municipal and the house where composer José “Pepe” Domínguez was born, he was the author of songs such as “Aires del Mayab” and “El Pájaro Azul” (located on Calle 21 x 24 y 22). On “La calle de los murales” (street of the murals, on Calle 6 x 21 y 23) you will be able to see the original artwork of over 20 local artists. These artists came together to capture the municipality’s culture and recent history in murals which adorn the wall of the local junior high school. Over 200 square meters depict scenes from daily life, pay homage to certain characters, and show important activities using different techniques and lots of color. A great attraction you won’t want to miss! Continue walking down the road and around the corner, you’ll see the elementary school which also has representations of animals and plants, just another sample of the artistic abilities of Dzidzantún’s children and youth. My next stop really lifted my spirits. In the beautiful hacienda San Francisco Tzacalhá, the children of neighboring communities have formed a choir called “Yudzat Il Kay” (The Art of Singing). They play Pre-Hispanic instruments such as the “tunkul” (slit drum) and ocarinas (a type of vessel flute) shaped like jaguars and turtles. They perform both traditional and contemporary songs in Maya, Spanish, and English under the direction of their Maestro: Eduardo Zarracino. To my delight, they performed “Hanal Weech” and “We Will Rock You”. This choir has performed in Germany, the White House, and of course, in Mérida. The hacienda where they have their presentations is charming, with magnificent gardens and gorgeous rooms which make for an ideal stay. 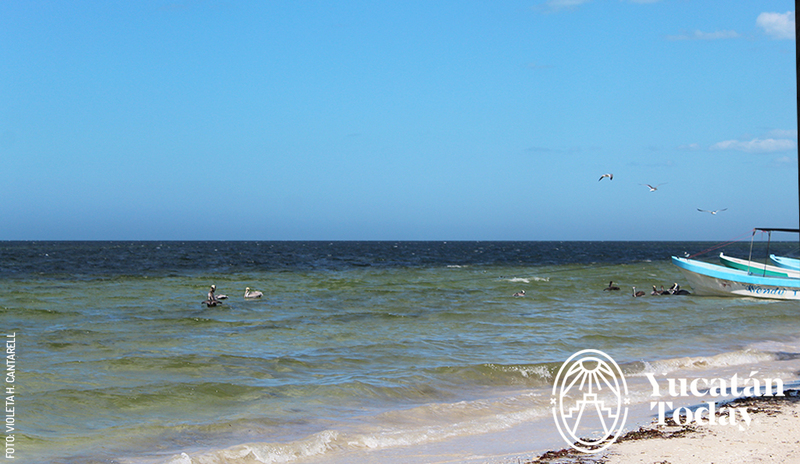 To finish, take in the cool ocean breeze in Santa Clara; you can even go swimming with the pelicans who will remain unfazed by your presence. Enjoy a fresh ceviche or fried fish at one of the local eateries. History, art, living culture, music, joy, and the beach… I never expected Dzidzantún to have so much to see and do. All I can say is, I can’t wait to go back!